Aside, if we can hack a non-captive onto the GM3 and somehow prevent the filament from rotating, that would make for a *damn* simple thermoplast extruder. Sprung pinch wheels below perhaps? This is somewhat beyond the scope of this post, I know, but what *is* the difference between a captive and non-captive stepper motor? 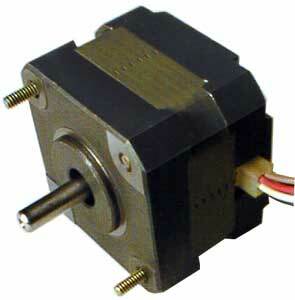 A captive stepper motor has a fixed shaft attached that rotates. A non captive stepper motor has a hole through with rotating threads, and a threaded rod that is put through the middle, if I understood it right. 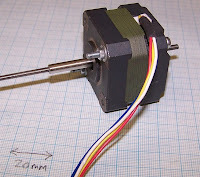 So a non-captive stepper motor is ideal for threaded drives, I believe Forrest is using them for his 3D printer Tommelise for example. "Aside, if we can hack a non-captive onto the GM3 and somehow prevent the filament from rotating, that would make for a *damn* simple thermoplast extruder." A) Two counter-rotating, coaxial gears: one with an M3, one an adjustable friction clamp. For the non-captive mechanisms, what prevents the threaded shaft from rotating with the rotor? I'd guess there'd be some sort of spline groove cut into the threaded shaft, with a stationary (mating) spline/key resisting rotation. However, I don't see any such in the photos. How do they prevent shaft rotation? Tests show that the seal friction in the syringe is more than enough to prevent shaft rotation (nice bonus!) - and the bigger the syringe diameter, the better this gets. If the animation is not clear I can make a drawing. Simply put, the motor and the captive nut are separated by a tube that transmits the torque. Let me know what your think. Syringe dispensers very cool. great for solder paste dispensing and possibly pick and place. I like the solution... obviously not as compact as a direct non-captive shaft, but still it does the trick.